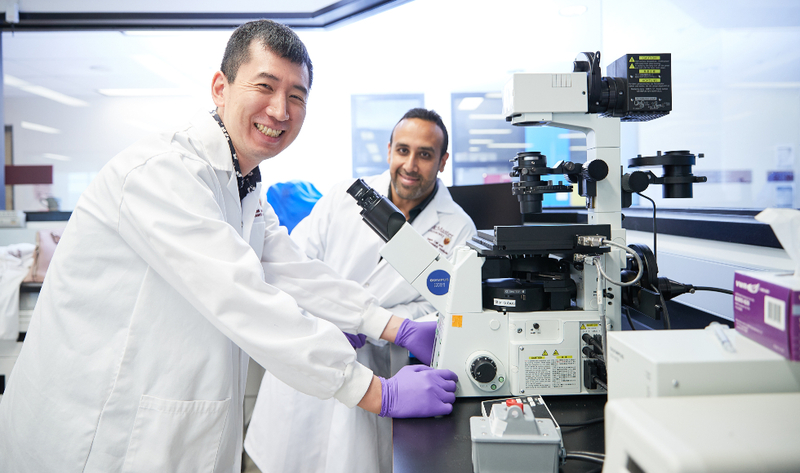 Mick Bhatia (right), director of McMaster University’s Stem Cell and Cancer Research Institute and Mio Nakanishi, postdoctoral fellow in the Bhatia lab. A team of McMaster researchers has discovered a unique subset of cells within human stem cells that appear to signal how the surrounding cells will develop and grow. The discovery of these "kingpin" cells, named human pluripotent founder cells, along with the process of identifying the cells, is expected to open a new channel of research aimed at better understanding the growth of cancerous tumours and how human stem cells make decisions on what to become or not become. <a href="https://www.cell.com/cell/fulltext/S0092-8674(19)30275-2">The study was published in <em>Cell</em></a>. “We found a population, unbeknownst to anyone, that seems to be a ‘kingpin’ of a stem cell ecosystem that is required to maintain and grow all the other cells,” said Mick Bhatia, director of the Stem Cell and Cancer Research Institute and professor of biochemistry and biomedical sciences at McMaster. “This class of human pluripotent stem cells has a very different set of genes, and thus follow a different set of rules, and respond to different types of signals.” Human pluripotent stem cells are considered master cells, and with their ability to differentiate into various cell types, these founder cells seem to be at the top of that stem cell system. Bhatia’s team spent more than six years delving down to the cellular level to examine what they say are previously overlooked cells that form on the edges of pluripotent stem cell colonies. Having characterized these cells, the team also observed them form at the earliest stages of pluripotent cell reprogramming from adult cells. By understanding and isolating these cells on the edges using a tool called single-cell RNA sequencing gene expression analysis, the researchers discovered a subset of cells with characteristics that made them different from the cellular ecosystem surrounding them. The McMaster team, together with collaborators at Harvard University, Monash University in Australia and Mount Sinai Hospital in Toronto, compared the characteristics of the human pluripotent founder cells to stem cells from mice, but did not find similarities. They did, however, find the same subset of founder cells in monkey stem cells. “We went on to different species because we figured this was something that was going to be universal, but we were shocked that it wasn’t as universal as we thought,” said Bhatia. “We spent a lot of time trying to prove this as a generalizable phenomenon, but as it turned out it was restricted to primates. This may help to explain fundamental differences in stem cell drug response in mice versus humans, and is part of our future testing.” More recent technology used by the researchers, in combination with new tools and techniques of data mining, proved essential to the research finding. “The technological advancement that allowed us to take it apart was this technique where we could isolate individual cells from the population and look at their gene profile,” Bhatia said. “It’s like looking at the population of Canada and taking a survey at the population level, and concluding at a population level that everyone in Canada likes hockey and Timbits. But when you start interviewing individuals, you avoid making generalizations, and you discover each person has unique features of their own.” The Bhatia lab is now using their learnings about founder cells and single-cell RNA sequencing analysis on the questions in human cancer. Tony Collins, a study author and the research manager in the Bhatia lab at McMaster, said the sophisticated big-data analysis used is essential to future learning. 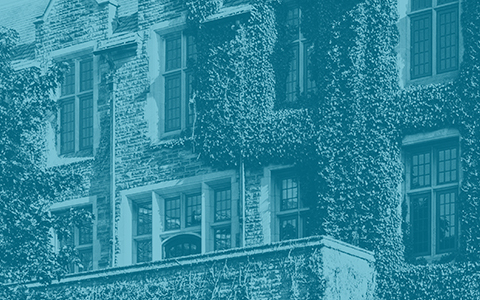 “This work is the type of sophisticated big-data analysis we see being essential in the future, and was only possible with the help of with the support of McMaster’s Research and High-Performance Computing Support. We are now applying our experiences with this technology and techniques to complex cancer systems,” said Collins. “Why does an individual cell become cancerous in the first place? What are the differences among cancer cells? Are features of these founder, or ‘kingpin’, cells present in a human tumour? “It is opening up a whole new set of criteria, and a way of looking at the cellular system, that we hadn’t really thought about until now.” The study was initially funded by the Natural Sciences and Engineering Research Council of Canada (NSERC) as well as the Canadian Institutes of Health Research (CIHR).